The first confirmed sighting of mainland Antarctica cannot be accurately attributed to one single person. It can, however, be narrowed down to three individuals. According to various sources, three men all sighted the ice shelf or the continent within days or months of each other: von Bellingshausen, a captain in the Russian Imperial Navy; Edward Bransfield, a captain in the British navy; and Nathaniel Palmer, an American sealer out of Stonington, Connecticut. It is certain that the expedition, led by von Bellingshausen and Lazarev on the ships Vostok and Mirny, reached a point within 32 km (20 mi) from Princess Martha Coast and recorded the sight of an ice shelf at 69°21′28″S 2°14′50″W﻿ / ﻿69.35778°S 2.24722°W that became known as the Fimbul ice shelf. On 30 January 1820, Bransfield sighted Trinity Peninsula, the northernmost point of the Antarctic mainland, while Palmer sighted the mainland in the area south of Trinity Peninsula in November 1820. Von Bellingshausen's expedition also discovered Peter I Island and Alexander I Island, the first islands to be discovered south of the circle. Equinox to equinox in line with the sun's seasonal influence, the Antarctic ice pack fluctuates from an average minimum of 2.6 million square kilometres (1.0×106 sq mi) in March to about 18.8 million square kilometres (7.3×106 sq mi) in September, more than a sevenfold increase in area. The Antarctic Circumpolar Current moves perpetually eastward – chasing and joining itself, and at 21,000 km (13,000 mi) in length – it comprises the world's longest ocean current, transporting 130 million cubic metres per second (4.6×109 cu ft/s) of water – 100 times the flow of all the world's rivers. 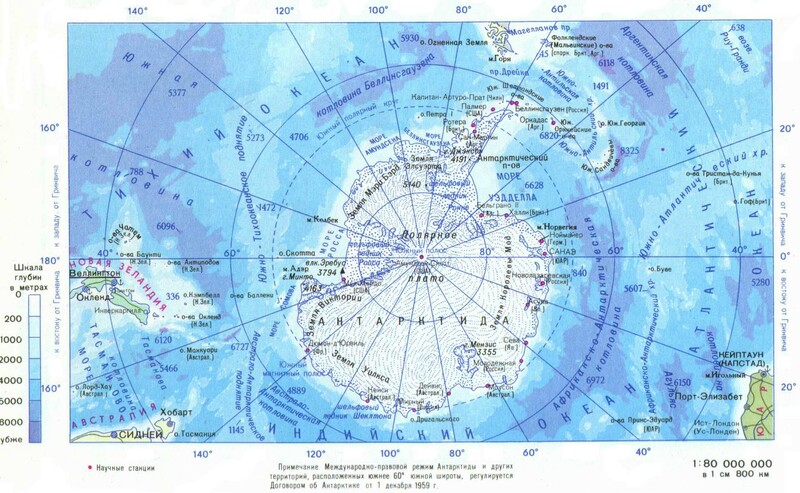 The Southern Ocean's southernmost port operates at McMurdo Station at 77°50′S 166°40′E﻿ / ﻿77.833°S 166.667°E. Winter Quarters Bay forms a small harbor, on the southern tip of Ross Island where a floating ice pier makes port operations possible in summer. Operation Deep Freeze personnel constructed the first ice pier at McMurdo in 1973. The 70th parallel south is a circle of latitude that is 70 degrees south of the Earth's equatorial plane in the Antarctic. The parallel passes through the Southern Ocean and Antarctica. The position of the Antarctic Circle is not fixed; as of 19 April 2019, it runs 66°33′47.6″ south of the Equator. Its latitude depends on the Earth's axial tilt, which fluctuates within a margin of more than 2° over a 41,000-year period, due to tidal forces resulting from the orbit of the Moon. Consequently, the Antarctic Circle is currently drifting southwards at a speed of about 15 m (49 ft) per year. The Antarctic bottom water (AABW) is a type of water mass in the Southern Ocean surrounding Antarctica with temperatures ranging from −0.8 to 2 °C (35 °F), salinities from 34.6 to 34.7 psu. Being the densest water mass of the oceans, AABW is found to occupy the depth range below 4000 m of all ocean basins that have a connection to the Southern Ocean at that level.The major significance of Antarctic bottom water is that it is the coldest bottom water, giving it a significant influence on the movement of the world's oceans. Antarctic bottom water also has a high oxygen content relative to the rest of the oceans' deep waters. This is due to the oxidation of deteriorating organic content in the rest of the deep oceans. Antarctic bottom water has thus been considered the ventilation of the deep ocean. The Bellingshausen Sea is an area along the west side of the Antarctic Peninsula between 57°18'W and 102°20'W, west of Alexander Island, east of Cape Flying Fish on Thurston Island, and south of Peter I Island (there the southern Vostokkysten). In the south are, from west to east, Eights Coast, Bryan Coast and English Coast (west part) of West Antarctica. To the west of Cape Flying Fish it joins the Amundsen Sea. Bellingshausen Sea has an area of 487,000 km2 (188,000 sq mi) and reaches a maximum depth of 4.5 kilometers (2.8 mi). It contains the undersea plain Bellingshausen Plain. In the late Pliocene Epoch, about 2.15 million years ago, the Eltanin asteroid (about 1-4 km in diameter) impacted at the edge of the Bellingshausen sea (at the South Pacific Ocean). This is the only known impact in a deep-ocean basin in the world. Cooperation Sea, also called Commonwealth Sea (erratum) or Sodruzhestvo Sea, is a proposed sea name for part of the Southern Ocean, between Enderby Land (the eastern limit of which is 59°34'E) and West Ice Shelf (85°E), off the coast of MacRobertson Land and Princess Elizabeth Land. It would stretch over an area of 258,000 km². It would be bordered by the Davis Sea on the east, and by another Russian proposal to the 2002 International Hydrographic Organization (IHO) draft, a Cosmonauts Sea to the west. The Cooperation Sea was named in 1962 by the Soviet Antarctic Expedition in honor of international science cooperation in Antarctica. The name first appeared as a proposal to the IHO in the IHO 2002 draft. This draft was never approved by the IHO (or any other organization), and the 1953 IHO document (which does not contain the name) remains currently in force. Leading geographic authorities and atlases do not use the name, including the 2014 10th edition of the World Atlas from the United States' National Geographic Society and the 2014 12th edition of the British Times Atlas of the World. But Soviet and Russian-issued maps do.Davis Station is located on the coast near here. Corallimorphus profundus is a species of corals in the genus Corallimorphus. It lives in marine habitats. This species can be found in the Southern Ocean and in New Zealand. Cosmonauts Sea (Russian: Море Космонавтов, More Kosmonavtov; sometimes misspelled Cosmonaut Sea) was a proposed sea name as part of the Southern Ocean, off the Prince Olav Coast and Enderby Land, Antarctica, between about 30°E and 50°E. It would have an area of 699,000 square kilometres (270,000 sq mi). It would be bordered by two other proposals from a 2002 International Hydrographic Organization (IHO) draft, a Cooperation Sea to the east, and to the west a Riiser-Larsen Sea. The Cosmonauts Sea was named in 1962 by the Soviet Antarctic Expedition in honor of the world's first cosmonauts and the beginning of manned space exploration era. The name first appeared as a Russian proposal to the IHO in the IHO 2002 draft. This draft was never approved by the IHO (or any other organization), and the 1953 IHO document remains currently in force. Leading geographic authorities and atlases do not use the name, including the 2014 10th edition World Atlas from the United States' National Geographic Society and the 2014 12th edition of the British Times Atlas of the World, though state-issued maps created by the Soviet Union and the Russian Federation do.The water here is close to freezing throughout the year and is mostly covered by ice. Between 1973 and 1986, several polynyas have occurred in these waters, with the totally enclosed Cosmonaut polynya attaining a maximum size on July 25, 1980, with an open water area of as much as 137,700 km2. This polynya lasted for several weeks before disappearing on August 16, 1980. Somov Sea (Russian: Море Сомова, More Somova) was a proposed name for part of the Southern Ocean. It would be located north of the easternmost part of the Antarctic subcontinent East Antarctica, north of Oates Coast, Victoria Land, and of George V Coast, between 150° and 170° East. West of it would be the D'Urville Sea. East of Cape Adare, at 170°14' East, is the Ross Sea.The name was first proposed by the Russians for the 2002 International Hydrographic Organization (IHO) draft. This draft was never approved by the IHO (or any other organization), and the 1953 IHO document (which does not contain the name) remains currently in force. Leading geographic authorities and atlases do not use the name, including the 2014 10th edition World Atlas from the United States' National Geographic Society and the 2014 12th edition of the British Times Atlas of the World. But Soviet and Russian-issued map do.The Somov Sea would have an area of 1,150,000 km² and be up to 3000 meters deep.The Balleny Islands are 240 km north of the mainland coast here.